Signature :Oosuriage Mumei (cut shortened) attributed as Hokke. Yamato Kuni Tegai Kanekiyo oosuriage mumei nari Jiha Kenzen Tenkei saku nari Kanzan shi. Habaki :single gold wrapped habaki. Blade length : 64.2cm or 25.2inches. Width at the hamachi :2.91 cm or 1.14 inches. Era : Early Nanbbokucyo period. Shape : Oo suruage Mumei and wide and thick with suitable sori and regular Kissaki nice looking shape. Jigane :koitame hada masanagare well grained fantastic beutiful texture. Shinogi ji:Koitame hada and mokume hada mixed. Hamon :Konie deki based koashi scatter in Hamon and round shape and Yakizume style. 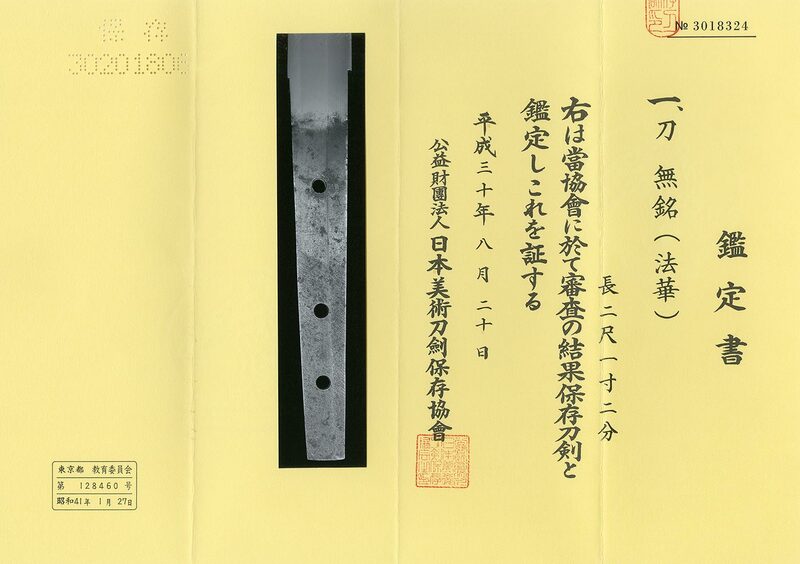 The blade was made around late Nanbokucyo period. Hokke Ichijyo, Kaneyasu. Shigeyasi and Nobukane Generally the blade looks Yamato school. Shinogi ji is nice Itame and mokume hada mixed. with syakudo and gold color. On the back, peony flower is engraved by syakudo plate and gold color. Menuki : On the syakudo plate, a smurai is engraved with gold color. 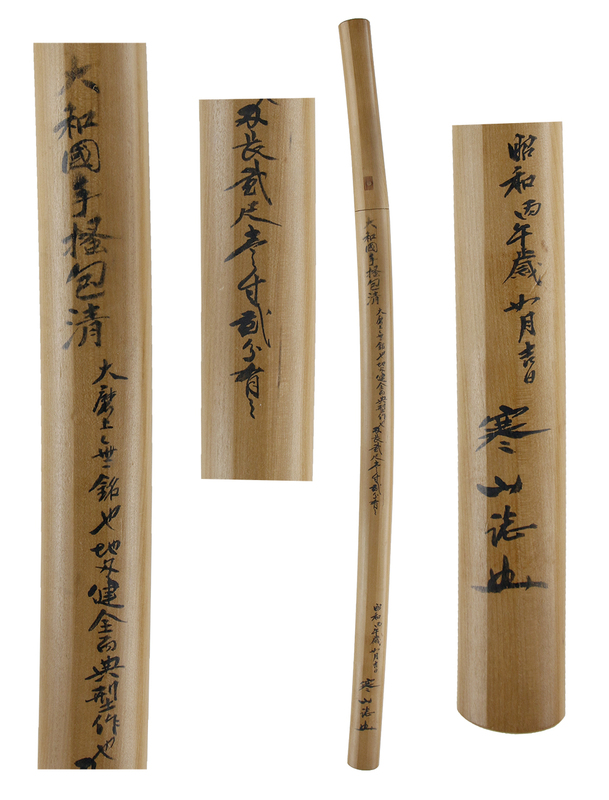 Fuchikashira: On the syakudo ishimeji matsu needles are engraved with gold color. From Aoi Art:Even though the blade is rather wide and thick the shinogi ji is mixed up mokume and itame. It is very lucky the blade was not engraved Bo-Hi on the sword. Tegai Kanekiyo. I think Boshi is Yaakizume style and beautiful nice texture so the sword looks Yamato Tegai school. Anyway the blade is high ranking quite well sword. Aoi Bijyutsu Syoshin paper :NBTHK hozon paper.